Vast fortunes made and squandered, powerful rulers seduced, ailments cured, and nations discovered... all in the name of spice. Spices have always cast a spell on our imaginations. They flatter our senses: our sight with their vibrant colors, our smell with their enticing fragrances, and our taste with their distinct flavors. Spices have been the catalysts of some of the greatest adventures in human history, like Christopher Columbus' voyage. They energize our daily adventures in food and remind us of journeys to exotic places and favorite meals with loved ones. Though the word "spice" didn't appear until the end of the 12th century (a derivative of the Latin word "species," which denoted a wide variety of products), the use of herbs dates back to early humans. Primitive peoples wrapped meat in the leaves of bushes, accidentally discovering that this enhanced the taste of the meat, as did certain nuts, seeds, berries--and even bark. In ancient times, spices and herbs were used as a way to mask the often unpleasant taste and odor of food, and later, to keep food fresh. The first spice expeditions were organized in ancient times to ensure that these coveted commodities would always be in supply. Legend has it that around 1000 B.C. Queen Sheba visited King Solomon in Jerusalem to offer him "120 measures of gold, many spices, and precious stones." A handful of cardamom was worth as much as a poor man's yearly wages, and many slaves were bought and sold for a few cups of peppercorns. Arab traders were the first to introduce spices into Europe. Realizing that they controlled a commodity in great demand, the traders kept their sources of supply secret and made up fantastic tales of the dangers involved in obtaining spices. At the crossroads of land trade from India and sea trade from the Mediterranean, spices played a huge role in Phoenician trade. The Phoenicians were expert merchants and smooth navigators; so much so that at the end of the 14th century B.C., spices were called "Phoenician merchandise." These slick middlemen knew how to offer their services to kings as well as pharaohs in order to extend their supply sites and possibly pave the way to India. 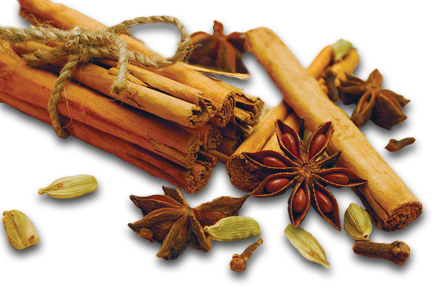 But spices' origins remained a mystery, despite the fact that, in the 4th century B.C., the great conqueror Alexander the Great lifted a part of the veil of this mysterious, magical India where, as Herodotus wrote, "cinnamon grows in deep lakes, near the homes of flying animals." The Roman Empire, whose boundaries progressively extended from one side of the Mediterranean to the other, couldn't ignore these bewitching spices. Cleopatra herself used a "very stimulating" food to seduce Caesar. Huge quantities of saffron were strewn on the streets of Rome to celebrate Nero's entrance into the city. The reputed excesses of ancient Roman food consumption were apparent in the wide variety of seasonings used in the meals of the rich. Pepper, the Roman spice of choice, was as omnipresent as garum (a fish-based sauce) on the Roman tables. Without a doubt, spices had become status symbols. In the biblical story of the Magi, three kings from the exotic reaches of the Orient give gifts of gold, frankincense, and myrrh to the newborn Jesus Christ. Frankincense and myrrh were rare, very expensive spices of the time. And in the 5th century, the prophet Mohammed, from the merchant tribe of the Quoraïchites, took advantage of the spice trade to spread his messages. People were more inclined to listen to what he had to say, given that he was selling irresistible spices. From the 10th century on, the crusades prompted a rediscovery of spices; seasonings made an obvious comeback to the tables of the great and powerful European courts. Brought to the Mediterranean basin by Italian ships, the "wealth of the Orient" was subsequently sold at market fairs to supply the Northern European countries. At this time, spiced wines from Italy and Spain were very popular. Certain spices were worth so much that one of them even became currency: pepper. In court, litigants bribed judges with spices. A prototype of sugared almonds, some spices were covered in honey in order to disguise them as candy. Their culinary and medicinal uses overlapped, and grocers and apothecarists often worked in the same companies. Besides traditional black pepper, some of the other prized spices of the era were long pepper from Sumatra, ginger, cloves, cinnamon, nutmeg, and galanga (a ginger-like spice from Southeast Asia). As with any great discovery, the opening of the Southern seaboard spice route was no accident. Portuguese navigators and geographers had been working at it for over a half-century. Henry the navigator, who encouraged exploration of the African coast, was the most famous of them. Christopher Columbus set sail in 1492 to head West and find gold and spices, hoping to hit the Indian coast where these precious commodities could be found. Controlling and supplying the spice market were key objectives for the Portuguese and Spanish powers at the time in their goal to overturn the Arab and Venetian monopoly in the Mediterranean. Vasco de Gama crossed the Cape of Good Hope in 1497 and arrived in India in 1498. The Arab merchants were shocked to see a Portuguese man on Indian shores. "We are looking for Christians and spices," stated the Portuguese navigator, and with that, the Arabs saw their monopoly crumble. In the centuries to follow, often the country with the strongest navy was able to gain dominion over the areas where spices originated. The Spanish, Portuguese, Dutch, and British empires all enjoyed leading roles in running the trade routes for a time. In fact, the last of these great spice monopolies, the Dutch, remained in existence until the outbreak of World War II. In the late 17th century, America benefited indirectly from the spice trade. Boston-born Elihu Yale grew up in England, where he worked as a clerk for the British East India Company, which held a monopoly on all trade with India. The company's ships brought the first cargo of nutmeg and cloves from the Moluccas Islands in Indonesia. Yale eventually became governor of Madras, India, and his spice fortune helped endow Yale University. But the economic value of these products declined as farming sites increased. The Dutch jealously protected access to the Moluccas for fear of seeing their clove and nutmeg trees exported to other regions, which would have ruined their monopoly. Thievery of this sort was punishable by death. After many attempts, a few pepper and nutmeg trees were successfully transplanted on Mauritius Island. This eventually led to a dispersion of plant production sites across Dutch, English, and French colonial empires, which involved spices in addition to coffee, cocoa, and many other plants. The tight reins on the industry were loosening. And what about Columbus? He certainly didn't make it to India, nor did he find the spices he was looking for, but he did stumble upon some significant additions to the world's cuisine. His exploration of the Caribbean islands, and others following his footsteps like Hernán Cortés in Mexico, uncovered bold new flavors that have become favorites all over the globe: familiar names like red pepper (which we know today as a wide variety of chiles), vanilla, and allspice. In the late 18th and 19th centuries, Americans became directly involved in the spice business as the sleek clipper ships of New England began to dominate world trade. So many pepper voyages were undertaken from New England to Sumatra that the price of pepper dropped to less than three cents a pound in 1843, a disastrous slump that affected many aspects of American business. Ultimately the New England spice trade fell off sharply when piracy in the Java and China Seas made long voyages for pepper too dangerous. Meanwhile, the American spice business, like the rest of the country, was moving west. In 1835, American settlers in Texas developed chili powder by combining various ground red peppers from Mexico, thus adding new dimensions to American taste. Later, once the gold rush had subsided, herbs were grown commercially in California. Mustard seed was grown in North Dakota, Montana, and Canada's prairie provinces. Today, colonial empires have all but vanished, spices are used in almost everything we eat, and costs are relatively low. It is hard to imagine that these fragrant bits of leaves, seeds, and bark were once so coveted and costly. For centuries wars were waged, new lands discovered, and the earth circled, all in the quest of spices.